Mont Bleu is a mid-size company based out of Prague, Czech Republic and is one of the world's leading suppliers of glass nail files. The company also specializes in luxury gifts, focusing on cosmetic and office accessories decorated with the original Swarovski crystals. 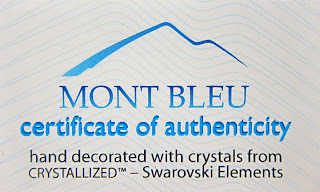 Mont Bleu gifts are professionally packaged, quality assured and come with certificates of authenticity. A couple of weeks ago, I was contacted by Mont Bleu to review some of their products. Czech glassware is famous for its quality, so I was particularly excited about trying out their glass files. I never knew nail files could be made out of glass!! Mont Bleu glass files are made out of tempered Czech glass and are decorated with patterns and/or crystals. 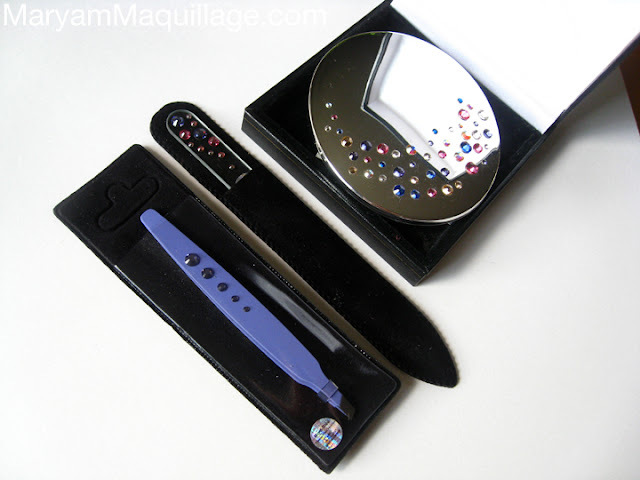 The Crystal line glass nail files are decorated with Swarovski elements and are some of the company's best sellers. 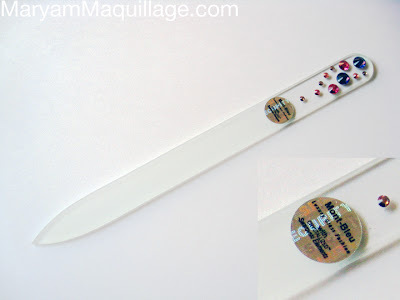 The nail files are about 5 inches (13.5 cm) long and are double sided. The prices for the Crystal line files range from 8-10€. My Thoughts: The glass file is almost too pretty to use and I must admit I was a bit reluctant at first. Although I wouldn't use this nail filer as a heavy duty tool to reshape my nails to a particular style, I would absolutely keep it in my favorite purse for snag nails. I would be very proud to take out this nail filer in public, as it has a very dainty, feminine and princess-y appearance. I think this is a terrific luxury gift for a girl who has everything. I know my best friends would love it! 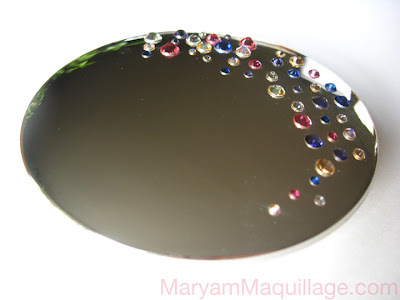 Every Mont Bleu design comes in a variety of products to create a set, so to match my glass nail file, I was sent a compact mirror decorated with Swarovski Crystals. The compact mirrors come in both plastic and metal, and include two mirrors (one zoom, one regular). The mirrors come in oval and square shapes and a variety of colors and finishes. The width of the oval mirror is about 3.5 inches (8.5 cm) and my photo above is almost true to size. The prices for compact mirrors range from 12-35€. My Thoughts: The mirror compact came in a very sturdy jewelry box, so I expected it to be very heavy. On the contrary, it is quite light (plastic) and perfect for carrying around in your purse. I like the fact that the compact itself isn't bulky, otherwise it would look like a carrying case for birth control. To complete my set, I was also sent some tweezers. Initially, this was the product I was least excited about due to the fact that I already own tweezers that I love. However, after trying these out, I became an immediate convert! These babies grab stray hairs better than any other tweezers I've tried and I'm not just saying that. I was so impressed that I even reshaped my beloved eyebrows, which I hardly ever touch! I know a lot of people tend to shy away from tweezers and I get it... they have a bad reputation for inflicting pain, but using this pair was miraculously pain-free. I don't know what it is about them, I guess they're just really well-balanced and high quality. 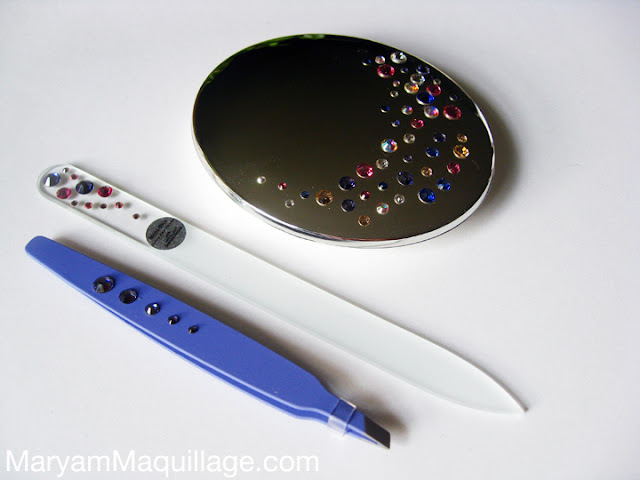 Mont Bleu tweezers with slanted tip are made from stainless steel and decorated with Swarovski crystals. The prices for tweezers range from 5-15€. 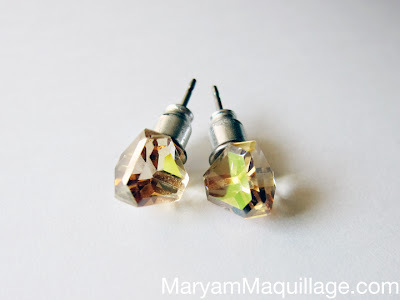 Last but not least, Mont Bleu "Golden Shadow" yellow stud earrings are hand-made with 8mm Swarovski Crystals and non allergenic metal. The unique pyramid shape is very eye-catching and different: I've worn these twice already and have gotten a few compliments. In addition to luxury cosmetic and office accessories, Mont Bleu also offers Costume Jewelry (including earrings, bracelets, hairpins, rings, etc.) as well as hair brushes, bag hangers, card holders, and other exclusive gifts for your friends and loved ones who enjoy that special little touch. *The products featured in this post were sent for my consideration and review. I was not compensated for this review and the information stated is 100% my own, uninfluenced and unbiased opinion. They look very unique. I bet the quality is awesome too! And i'm in love with those Earrings girl, so special, i got to go check this page out. Looks pricey though. Love the eye makeup! Sounds like a great company. Ciao Maryam, I love your make up you are amazing!!! wow! This is an amazing gift and I love the look you created! Hi Maryan, I love your inspiration!!!! Lovely as always!!! Love it is to cute and the make up very diferent ! After using it a few times, I can confidently agree with you. They are indeed the best!!! Great look, very creative! I love the pink and orange lips. I am just so impressed with these Mont Bleu glass files...I wish I could manage too grab these from my nearest stores too...Great stuff all around! !